1. Heat a griddle and place the sliced peppers and onions on the heated griddle. 2. Sprinkle with salt and pepper and drizzle with olive oil. 3. Place the bacon in a heated pan and cook until crispy. 5. 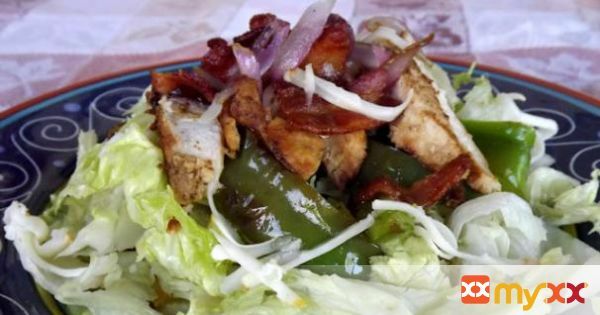 Place the salad greens on a plate and top with the grilled peppers and onions. 6. Top with the sliced chicken and bacon. 7. Drizzle a little of the bacon fat over the salad, and top with the crispy bacon and grated cheese.